President John Agyekum Kufuor on Friday counseled kingmakers to resist all forms of influence in the selection of chiefs to vacant stools and skins to help end the spate of succession disputes. Otherwise, he said, the dignity, relevance and the place of the Chieftaincy Institution in the country could be endangered beyond repairs. 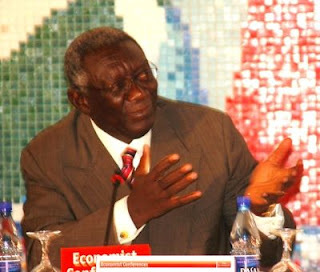 President Kufuor, who was addressing a colourful durbar of chiefs at the Centre of National Culture in Kumasi to round off the National Festival of Arts and Culture (NAFAC 2007), said it was the hope of the Government that findings of the current research into “succession to stools and skins” would provide insights that would help all stakeholders to make informed decisions on succession issues in the future. “Meanwhile, I urge Nananom to take advantage of the structures created by the 1992 Constitution and the Chieftaincy Act of 1971, in the resolution of chieftaincy disputes that afflict this country and sometimes threaten to derail its development.” Additionally, he said, as custodians of culture, they must promote the eradication of cultural practices that were injurious to the dignity and rights of individuals, particularly, women and children. President Kufuor noted that good governance and the rule of law, in the traditional setting, were known in principle, to refer to fairness, justice and protection of the vulnerable including women, children, the aged and the physically challenged. “Nowhere was the concern for sanitation and environment more keenly in evidence than the traditional setting. This is why all our Constitutions have recognized the Chieftaincy Institution.” He said it was however, sad, that in practice, with regard to human rights, especially rights of women, widows and the girl child, not all aspects of the nation’s culture reflected the spirit and letter of the Constitution. Touching of the exhibition of items from various cottage industries at the NAFAC, he said, it was a confirmation of the potential of the cultural sector, which must engage the chiefs and District Assemblies as they sought ways of generating employment and growing the national economy. He also used the occasion to whip up support for the Ghana 2008 Football Tournament and said all should work to make it memorable. This should be one of the nation’s finest moments, he added. “This is a tournament that will attract thousands of football fans and tourists to the country.